A popular quote by Maya Angelou states, “I’ve learned that people will forget what you said, people will forget what you did, but people will never forget how you made them feel.” I’m not sure if I totally agree with that since words and actions can be very important too but none the less, how others feel about being around us is something worth spending time exploring and improving. Stop and reflect for a moment how you interact with others. When they’re talking, are you listening? I mean really listening? Most people are not really listening but rather thinking about their response to what the other person is saying. It is nearly impossible to be fully concentrating on what someone is saying while formulating a response at the same time. The need to be understood, heard and valued is at a person’s core, and when they are not listened to, they feel disconnected from the other person. Rather than gathering your thoughts for your response, try asking follow up questions to what the other person has just said. This is especially important if the person has just shared with you something heartfelt and full of emotion for them. In addition to fully listening when others are talking, try not to pass judgement on what they are saying. We are all different and value different things so it’s important to allow the other person to be able to share their thoughts freely without the intimidation of feeling as though they are being judged. That doesn’t mean that you have to agree with what they are saying, but there are ways that you can disagree and still allow them to feel accepted as a person around you. People pick up cues as to how you feel about them by your body language as well. Keeping your body language open and inviting will allow the other person to feel free to share their thoughts with you. You can check this by observing your body language when others are speaking to you. Are you smiling when appropriate, making good eye contact, keeping your arms uncrossed, and leaning toward the person speaking? When it is your turn to speak, are you using a positive tone? These are all things that make the other person feel as though you care about what they’re saying. Observing how you respond when others are around you and speaking to you is always a good self-check tool. We may not even be fully aware of how we come across to others, which could cause us to give off airs that we don’t care about others when in fact that is not the case at all. Find a friend you trust and ask them how you come across to them and what they might suggest to improve your interaction with others. Sometimes it’s just is a matter of being aware of our shortcomings and how to practice making them better. Emotional intelligence is the skill of perceiving, understanding, and managing emotions and feelings. It is an art that comes easily to some and takes practice for others. At a deeper level, it is the art of being able to overcome self and put others first. Most people love to share information about themselves. They know the topic well, and it’s interesting to them. Allow people to do this when they speak to you. Encourage them by asking follow up questions and by keeping the conversation on them. This produces endorphins in them that make them happy. Why wouldn’t you want people to be happy around you? A good conversation will allow both parties equal give and take where this is concerned, but if Maya Angelou’s quote is true, then it really doesn’t matter what you say next because in the long run, the person is only going to remember how you made them feel. Director of Human Resources – McGowen, Hurst, Clark & Smith, P.C. In today’s world of online bill pay, swiping your phone for payment, and direct deposit of paychecks, it can be hard for children to grasp the concept of money. However, teaching your children smart money management can pay dividends over their lifetime. The following are just a few tips/ideas to help your young children learn smart money management. Talk to your children about your finances. While you don’t have to make them privy to every detail, they should understand how you work hard for your money and the spending priorities you have as a family. Enlist your children to help make a family budget. Pick a spending category or two, such as eating out and clothing, and create a budget. Post and track those budget categories in a common area. At the beginning of each month post that you have X amount of dollars to spend on say, eating out during the month. Helping your children deduct any expenses in that category as they occur and calculating the remaining balance helps children realize the spending limits you have. Encourage your child’s entrepreneur spirit. Helping your child host a lemonade stand at the end of your driveway or helping them sort through their gently used items to sell at a secondhand store can be great learning experiences for your child. Plus, it can provide them with some money of their own. Providing your child with an allowance is another way you can help your child build a foundation in money management. 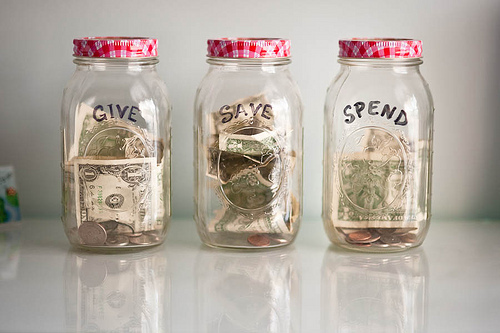 Help your child budget their allowance each week among buckets of spend, save, and give. Reading to your child is another way that you can sneak in some financial lessons for your children. There are some great children’s books that have money messages. “Alexander, Who Used to Be Rich Last Sunday” by Judith Viorst, “The Berenstain Bears – Trouble with Money” by Stan & Jan Berenstain, and “Isabel’s Car Wash” by Sheila Bair are some of the money books that my children have enjoyed. Interested in learning more ways to be financially savvy? Check out Money Smart Week, April 23-30, 2016. All programs are free to attend and strictly educational as sales pitches/marketing activities are prohibited. More information can be found at www.moneysmartweek.org . You are currently viewing the archives for April, 2016 at McGowen, Hurst, Clark & Smith.